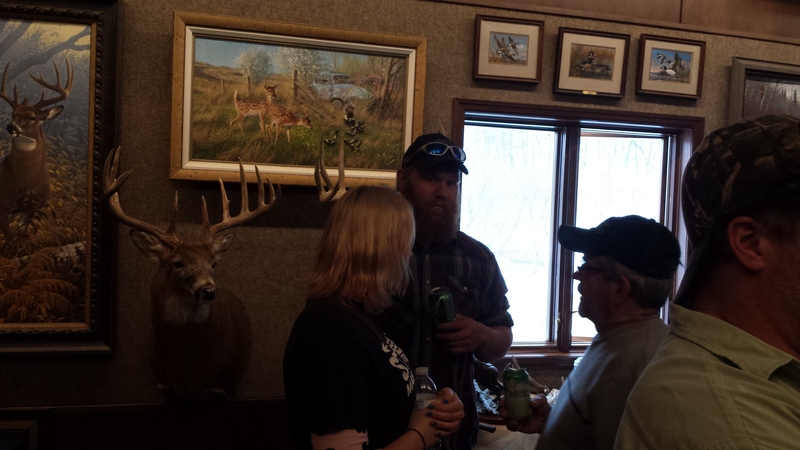 On Sunday, February 8, we hosted a get-together with a group of my hunting friends at the gallery. Dave Boland and Craig Pierce, both Boone and Crockett (B&C) measurers, were there to score recently harvested deer. We have been doing this for several years now, at first in Rushford at Jeff Bunke’s home and now in my gallery. There is more space here, and with all the big deer that came in, we needed it. 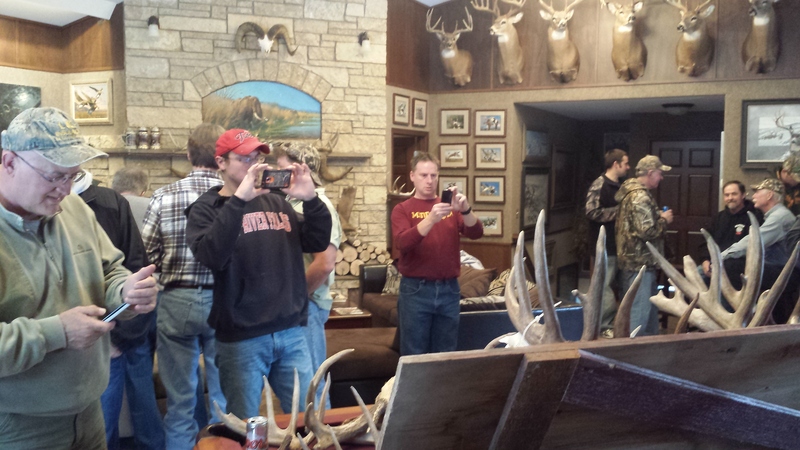 There were about 40 hunters and guests here, and many heads came through the door, almost all from last fall and almost all local deer. Here are a few photos. Bowhunter Craig Beckman took this great buck last November on the family farm just north of Houston. If you like non-typicals with great character, this fantastic buck is your kind of deer. Final score: 220 6/8 non-typical (NT). Bob Borowiak tells the story of Lefty. Bob hunted Lefty for three years until last fall when this super buck was taken by Pat (Petey) Holmstadt, a friend of the landowner whose land this buck lived on. This deer was taken by muzzleloader (ML) on November 30 and scored 211 gross and 203 net NT. This was Petey’s first buck ever. It’s going to be hard to beat that. 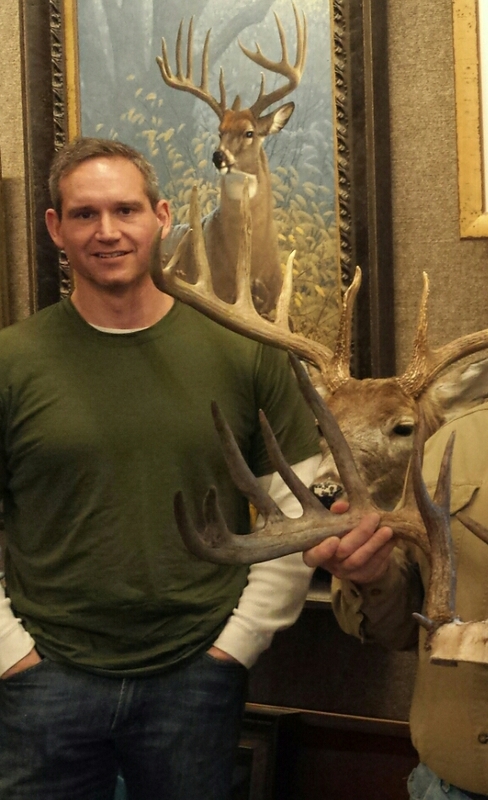 Craig Pierce and Dave Boland score the great velvet buck taken near Ridgeway by Chris Warren. Final score is 229 4/8, a new Minnesota record and one of the top velvet bucks of all time. Chris had this buck under his stand and only a few feet away but couldn’t get the shot until the deer moved out a ways. Chris’ brother Josh helped recover this buck after a two-day search in the thick green cover of the opening weekend of bow season last September. These guys were persistent and did a good job of tracking. Congratulations on the new Minnesota state record velvet buck! 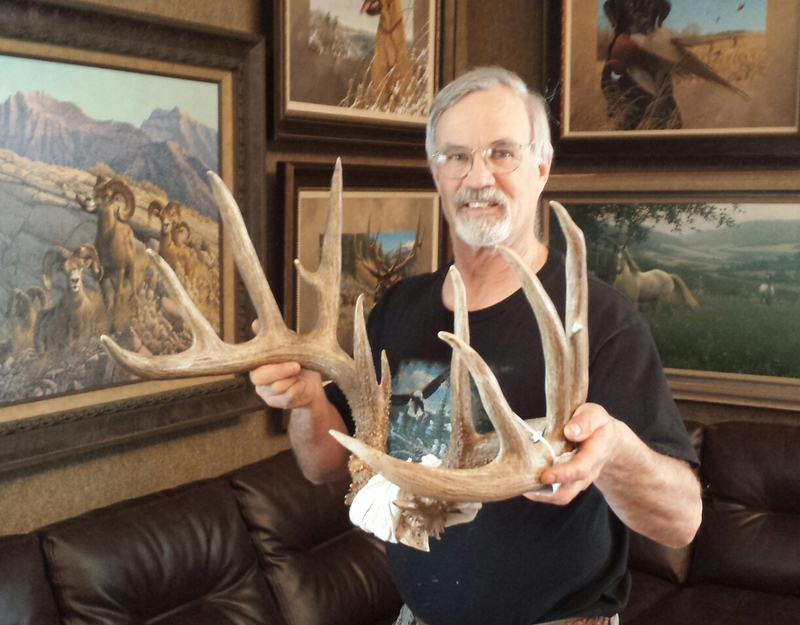 Layton Kreidermacher tells the story of Stan Kreidermacher’s ML buck from last November. This monster was a local legend in the Whitewater area and was taken on public land on the last day of the 2014 Minnesota ML season. Stan was the lucky hunter who got this buck but lots of other guys were after him that day, including Layton and Landon Kreidermacher and Scott Bjornson who helped Dave Boland measure this deer. This magnificent buck is a potential new Minnesota state record ML buck but the final score has not yet been determined and announced. Stay tuned. Here I am holding the Kraig Garmaker buck. Kraig bought land a couple miles from my gallery last year and took this buck with bow and arrow on his new property the first time he hunted there. This great buck has a classic 10 point frame with long sweeping wrap-around main beams, great mass and height, and 5 extra points. After deductions he still makes the all-time B&C typical (T) record books. 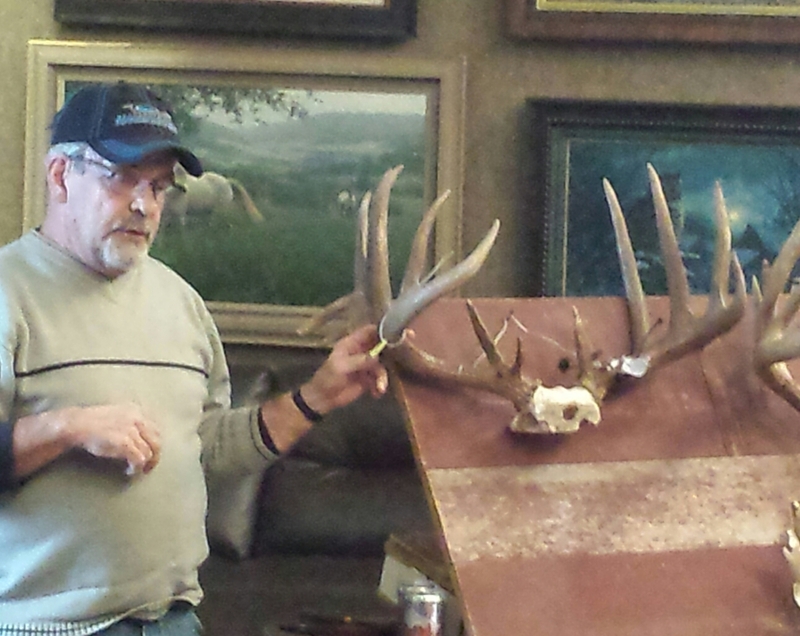 Peter Gauchel tells the story of his super buck from last fall. This deer lived on his friend Glenn Affeldt’s land near Caledonia. Peter is a handicapped hunter, and had quite an adventure in hunting and finally harvesting this deer with shotgun last fall. At the end of the day he was out of slugs but he had a B&C buck to be proud of. 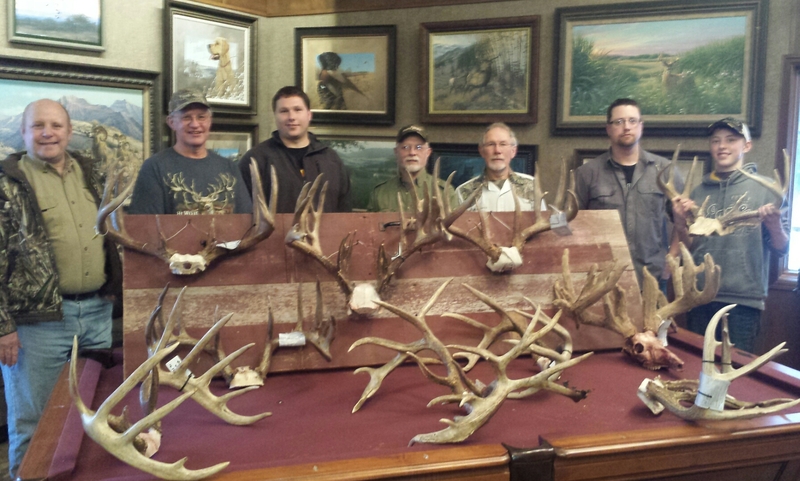 A group of big local bucks from 2014 with several hunters in the back, along with Craig Pierce and Dave Boland, B&C measurers. 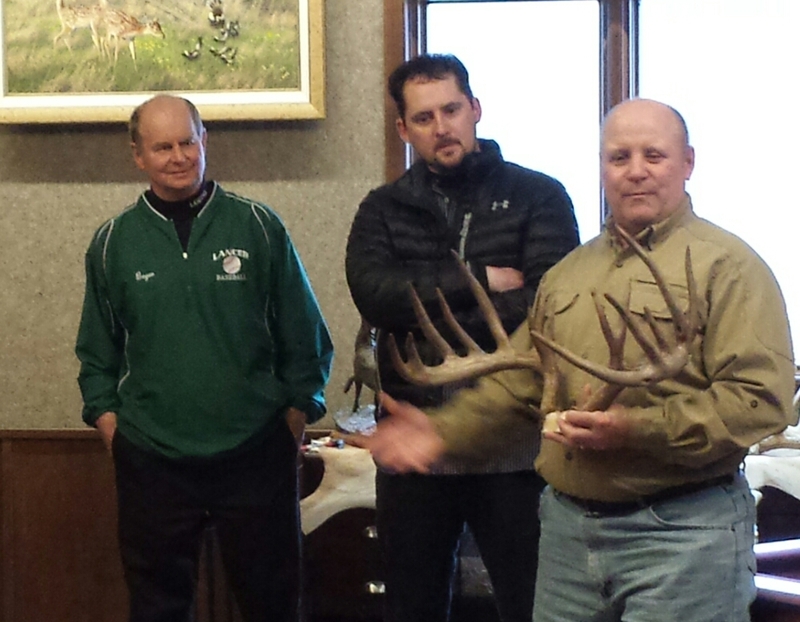 On the far right, Eric Rataczak holds a deer rack his grandpa shot in the Camp Ripley military base many years ago. I will predict that someday Eric Rataczak will be holding a big rack from a monster buck that he gets with his bow. Again, stay tuned. 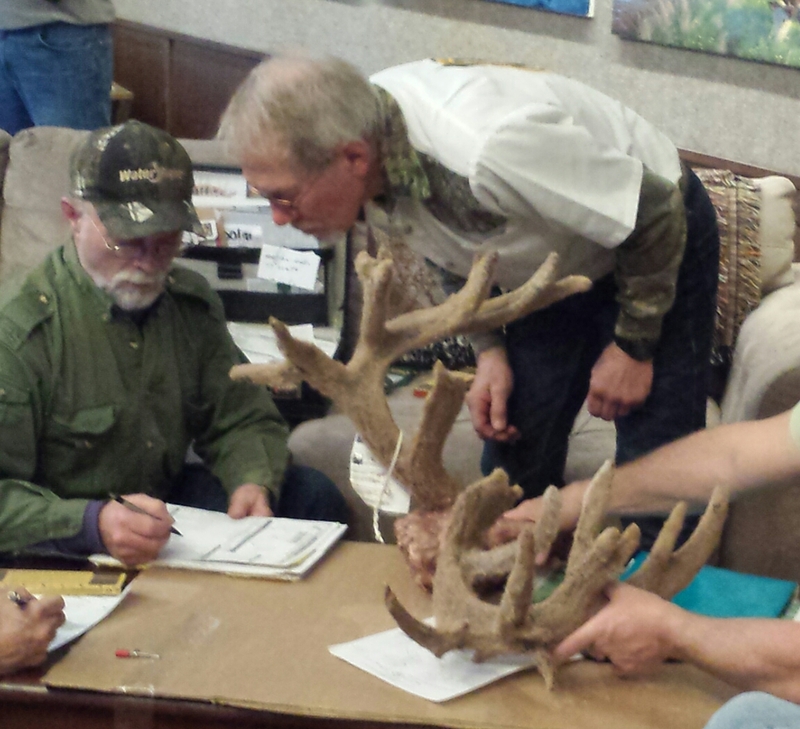 We also had the Loren Woalkens buck that was a B&C typical and the Steve Olson B&C 12-point typical from 2012. Steven Olson’s deer is very special to me. I spent most of my 2012 bow season trying to take that buck. He lived on my farm on Oak Ridge outside Houston. I knew him and passed him as a 135 inch 4×4 in 2009. In 2010 he was a 150 class 4×4 but I took my backyard buck early that fall and was unable to harvest a second buck. In 2011 he was a 165 class 5×5 but I never had a chance at him. And in 2012 Steven Olson got him as a mid 170s B&C 6×6 T. Here is Steve with his big 12. A painting of my backyard buck hangs in the background. By the end of the day there were eight local B&C bucks in the gallery, six of them from 2014. 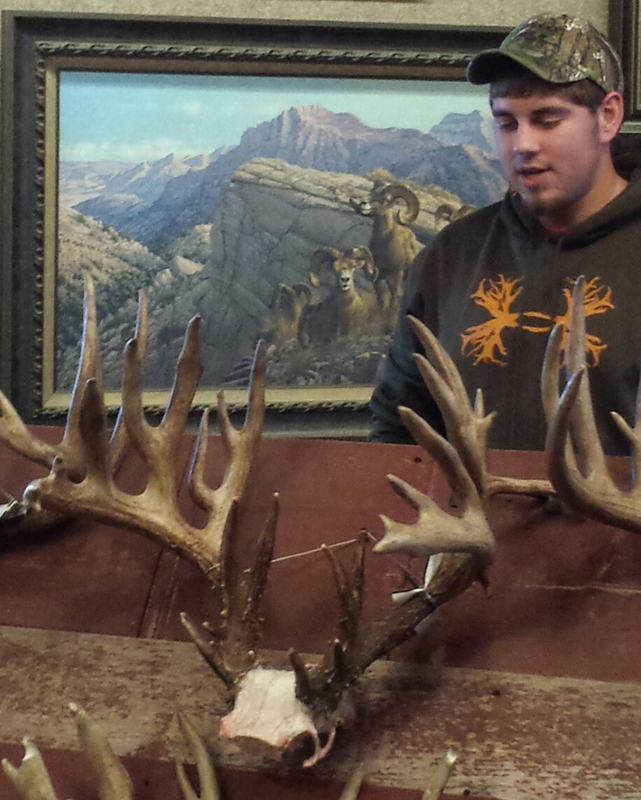 Three of them were over 220 inches, two of them will probably be state records, and one of the three was taken on public land. We also had a lot of nice bucks that were taken last fall by other hunters. These bucks didn’t make B&C but are all special in their own way, especially to the hunters who took them. Three of them are special to me because the hunters are my neighbors. All took the best bucks of their lives last fall. This area has great potential and the hunters that came to this get-together proved it. It was a great day. 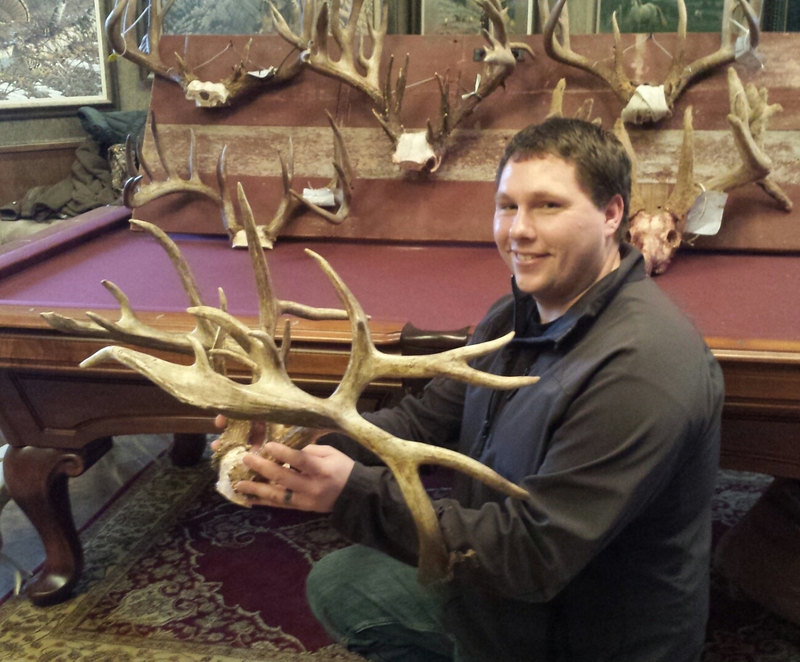 And finally, there were several big sheds picked up this winter from last fall’s survivor bucks. A couple of these sheds are from separate 10 point bucks of clear trophy age and size and were found on public land near my home. One of these two will be right at B&C size next fall. I’m not saying what public land parcel it is, but if you see my truck parked there, you’ll know what buck I’m after. This area of the state is getting better every year and all the hunters in my gallery for this deer hunters’ party will be anxious and excited for next deer season.